Proceed along the Highway No.A14, Bologna-Taranto, and take the road No.57 into Taranto from the direction of Bari, passing the large industrial complex on the left. Follow the sign to Grottaglia and then the signs to Tamburi Cimitero (Cimitero San Brunone). The CWGC Cemetery can be found on the road (which is one-way) just past the communal cemetery. 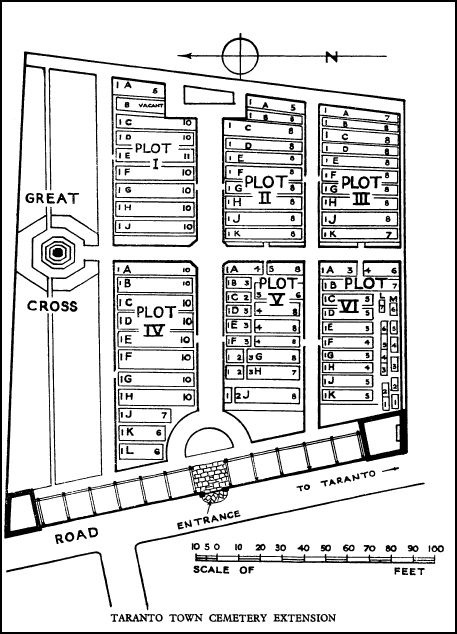 Cemetery address: Via San Brunone - 74100 Taranto (TA) Puglia. GPS Co-ordinates: Latitude: 40.490483, Longitude: 17.219963. If you wish to visit the cemetery when the gates are locked, the combination to the padlock is 1221. To open the lock you should press a button on the lock after having dialled the combination number. Taranto was used as a base by the Royal Navy immediately after the Italian declaration of war, but its importance to Commonwealth troops dates from the summer of 1917, when the Mediterranean lines of communication were established. These lines ran from the eastern theatres of war through Taranto, Turin, Lyons and Le Mans to Cherbourg. A base and rest camp were made at Taranto and labour units, including the 8th, 10th and 11th Battalions, British West Indies Regiment, were brought in. No 79 General and No 6 Labour Hospitals followed. The Town Cemetery was used for Commonwealth burials from June 1915 to April 1919, but as early as January 1918, it became necessary to open a military extension. 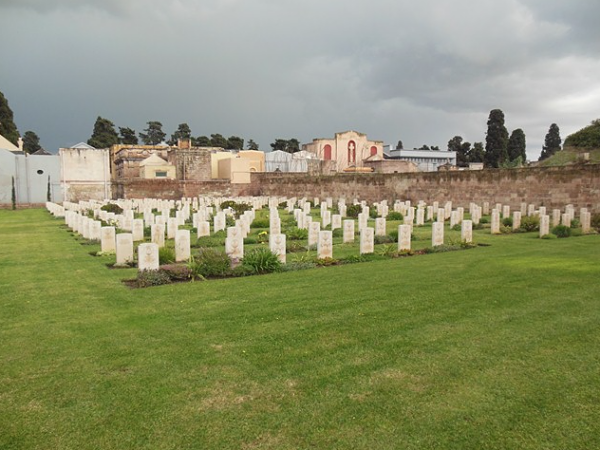 After the Armistice the 102 Commonwealth burials in the town cemetery were removed to this extension, and the grave of one sailor was brought in from Trani Communal Cemetery in 1958. There are now 449 Commonwealth burials of the First World War in the extension. There is also 1 Non World War burial. 11080 Private Albert Denny, 8th Bn. British West Indies Regiment, executed for murder 20th January 1919. Plot 6. D. 4.